Anthropology alumna Teresa Valencia '07 has always been passionate about the pursuit of justice. As an undergraduate, she planned to study forensic anthropology to find justice for victims of crimes. After graduation, the idea of law school crossed her mind. But eventually, Valencia decided to become the “rebel within the museum” and work to protect artifacts and champion their return to native tribes. As director of curation and education for Iolani Palace in Honolulu, Valencia oversees the curation and repatriation of Hawaiian artifacts and their exhibition, as well as curriculum development for the museum’s education department. Valencia was drawn to anthropology almost immediately after taking a cultural anthropology class to fulfill a general education requirement. “After that class, I decided I definitely wanted to do anthropology,” Valencia said. Valencia also appreciated the smaller class sizes she found in the Department of Anthropology and the chance to interact one-on-one with her professors. An internship at the Maidu Museum, a small indigenous museum in California, sealed the deal and cemented Valencia’s desire to pursue cultural anthropology and work in museums. The day after graduation, Valencia drove out to California to start work at the Maidu museum full time. Throughout her career, Valencia has worked in various museums and cultural sites in California, including Alcatraz, where she conducted tours on the Native American occupation and protest of the island. Eventually, Valencia decided to obtain her graduate degree so she could pursue leadership positions in museums. While earning both her master’s in museum studies and her MBA, Valencia had the opportunity to work for the Exploratorium, the Asian Art Museum, and as her final internship for credit, at Iolani Palace in Hawaii. In the late 1800s, Iolani Palace served as the official royal residence of King Kalakaua and his sister and successor, Queen Liliuokalani. The palace was a symbol of the strength and sovereignty of the Hawaiian Kingdom and its role on the international stage. It continues to hold an important place in the hearts of the people of Hawaii today. 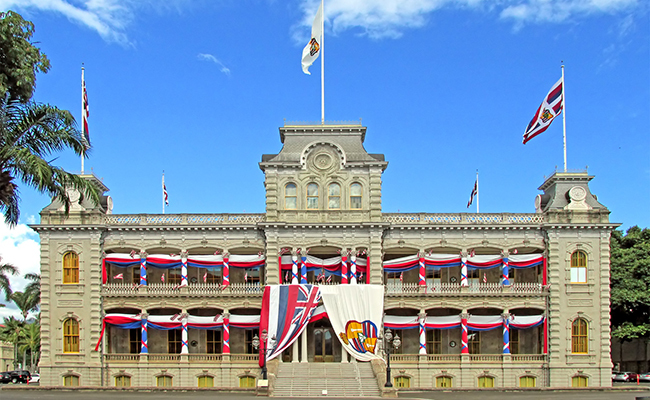 Iolani Palace adorned with bunting in honor of His Majesty King Kalakaua's birthday. In her role now as director of curation and education of the palace, Valencia works with native groups to facilitate the care of Hawaiian artifacts and the interpretation of their history. The concept of shared authority is something Valencia first encountered while interning at the Maidu Museum. Valencia explained that museums began as very colonial institutions, where objects, often looted or stolen from their cultures of origin, were placed on display. Historically, the policies for care, exhibition and interpretation were also written solely from a Western perspective. The idea of shared authority, as well as traditional care practices, when dealing with artifacts is an attempt to de-colonize the museum field and, in Hawaii, to re-nationalize.
.@OSUAnthro alum oversees curation and repatriation of Hawaiian artifacts at @IolaniPalaceHI. Valencia credits her anthropology degree at Ohio State with broadening her mindset and teaching her to value different viewpoints on the job. For students hoping to pursue museum work, Valencia recommends patience and reminds them to work on their cultural competence. “When you’re just starting out, you need to value the time to learn as much as you can,” she said. “Especially if you want to work with a culture that is not your own, it’s important to understand your role is not to talk and to teach, but to listen and to learn."